Kenyans are still coming to terms with the recent ban on production, importation and use of polythene bags that was imposed by the Cabinet Secretary for Environment and Natural Resources on 28th February 2017. The ban is due to be effective after 6 months, that is on 28th August 2017. One of the sectors known to use many polythene bags is the growing of tree seedlings. Most tree nurseries nurture seedlings in polythene bags. Owners of the seed beds have always argued that polythene bags have many advantages which include being cheap, readily available, easy to use and hold the water inside the bag reducing the need for regular watering, and hence reduction in water bills. The owners of tree nurseries however are not keen to mention the negative impact of the polythene bags such as visual pollution, littering, clogging of water drainage systems, death of livestock and wildlife through feeding on the bags, air pollution when bags are burnt and the health effects of carcinogenic furans and dioxins breathed in with the smoke. Now that the ban is in place, it is crucial that we reflect on alternatives to the polythene bags for growing the tree seedlings. Alternatives in this case include bags made from natural fibres such as cotton, sisal, grasses, papyrus among others. Fortunately the skill to make the biodegradable bags is resident within communities. Hence with the enforcement of the polythene ban, it is expected that people in rural areas especially women will be contracted to supply these alternative bags. These bags have not been popular for this purpose because of the extensive preference of the polythene bag. Biodegradable bags made through an industrial process are also expected to come in handy in tree nurseries. These bags are made of petrochemicals, though manufactured differently as compared to the normal polythene bags. Biodegradable bags are made to break down quickly in the presence of air and sunshine hence are labeled as oxydegradable or photodegradable respectively. Other industrial biodegradable polythene bags could also be made from organic, renewable sources, such as vegetable oils, corn, and grains. Some biodegradable plastics/polythene bags are compostable and can decompose to create humus releasing valuable nutrients to the soil. There are many factories that manufacture biodegradable bags, and it is highly likely that there are shiploads of these bags in high seas heading to Kenya to service the gap created by the polythene bag ban. A study done on biodegradable bags(see this link ) showed that they present more survival advantages to tree seedlings as compared to the polythene bag. It was noted that seedlings grown in biodegradable bags do not suffer the shock and disturbance experienced during the translocation of the seedlings. You are familiar with the process of planting a tree seedling that was grown in a polythene bag. The seedling must be removed from the polythene bag. During this process, in some cases, the soil gets disturbed, loosens and scatters and expose the roots. The seedling hence suffers some shock and this interferes with the rate of establishment of the seedling within the new environment. This is not the case with a seedling grown in biodegradable bags. There is no need to remove the seedling from the bag, just insert it into the prepared hole and bury the roots in the soil. After some time, the bag will wither and rot and the roots will establish themselves within the new environment. Planting tree seedlings nurtured in polythene bags has been a challenge to many people. I remember one incident I visited a school in Kisumu County to monitor seedlings survival in a project sponsored by the Ministry of Environment dubbed “Green Schools Project”. One headteacher showed us a site they had planted over 500 tree seedlings but only about 20 were still surviving. When we enquired why the survival rate for the seedlings was very low, he responded that the school made a mistake of not removing the polythene bags when the seedlings were being replanted. Hence they planted the tree seedlings while still inside the polythene bag. The roots of these seedlings could not reach water and nutrients outside the bag and the trees were starved to death. As an educator, I was baffled since I had assumed that tree planting was an easy task. If an activity supervised by qualified teachers could accommodate such a mistake, what about the general public who are not highly educated? It is therefore evident that the elimination of polythene bags would lead to enhanced survival of tree seedlings as well as reduced environmental pollution. The biodegradable bags bring forth numerous benefits and will contribute to reduction of wastage of our precious tree seedlings. This is a welcome gesture since the country is determined to increase her tree cover to 10% as prescribed in the Kenya Constitution 2010. Those dealing with tree nurseries should hence hurry up to embrace the alternative bags as the effective date for the ban is quickly approaching. All efforts should be made to prioritize locally made alternative bags as a way of supporting employment opportunities for the local people. 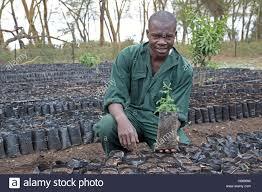 Muriuki J.K et al (2014) Testing Biodegradable Seedling Containers as an Alternative for Polythene Tubes in Tropical Small-Scale Tree Nurseries Small-scale Forestry: Volume 13, Issue 2 (2014), Page 127-142.
where can I get these bags? Would be glad to get a sample before placing my order. Mostly interested in sizes 4*6, 5*8 and 6*9. I’m James, Dealing in selling biodegradable seedling planting bags ,an economical substitute of the banned polythene bags in Kenya, for more inquiries or pictures I’m available in WhatsApp via 0725452203 or 0732078719. Education for Sustainable Development (ESD)Learn how sustainable development can be nurtured through education. Seven reasons why Kenya banned the plastic carrier bags?